Providing an unexpected amount of strength given its 3mm diameter, this 1×19 galvanised rope is produced to fulfil a range of needs. In particular its corrosion resistance is a strong suit, letting it last longer in adverse conditions without rusting. Where is 3mm 1×19 Galvanised Wire Rope used? As the 1×19 strand structure is not exactly specialised in nature, this galvanised rope ends up appealing to a wide spectrum of prospective buyers. It is clearly an effective option in marine environments and outdoor settings, although it is not solely found in such scenarios. Measuring 3mm thick, it offers up to 944kg of load capacity and yet is still slender enough to make sense as a decorative addition in any design project you might be pursuing. The low stretch, high strength construction keeps this rope in one piece even if it is subjected to significant forces. As long as you adhere to lifting safety regulations, it can be used for practical duties. 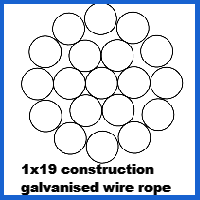 With a wealth of wire rope fittings on offer, Rope Services Direct can take your 3mm 1×19 galvanised rope and render it even more useful. Specify the parts you require and give us the go ahead to construct a custom assembly if you have something specific you want to achieve. Who can I talk to about 3mm 1×19 Galvanised Wire Rope? No one knows more about galvanised rope and other associated products than the RSD sales team. Call them today on 01384 78004 or drop them an email to discuss your options. 3mm 1x19 Galvanised Wire Rope Overall rating: 5 out of 5 based on 6 reviews.